Around four months before he will perform, according to Hardwell’s press team, over 125,000 people have apparently already registered to get on his guest list for his United We Are at the ‘World’s Biggest Guestlist Festival’. After the World’s Biggest Guestlist event held in December of 2015, this year’s event’s World’s Biggest Guestlist is set to close on Monday 14 August 2017 at 5pm. In cooperation with Shailendra Singh’s GuestList4Good and Hardwell’s United We Are Foundation, Hardwell will be taking over the third day of the World’s Biggest Guestlist Festival (WBGF). Closed by Hardwell on Sunday, 3 Dec, the festival will accommodate for sports, live Bollywood and pop music. 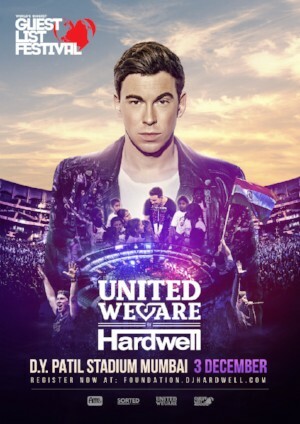 The ‘United We Are by Hardwell’ show will see Hardwell be joined by some of his DJ friends in an attempt to raise awareness about the challenges to basic education that the children of Mumbai, and across India, are exposed to on a daily basis. The event aims to bring positive social change in India as it will receive international awareness- similar to the 2015 edition, which apparently had over 23 million shares across 75 countries online, 80,000 people on ground and was recognised by the United Nations.